Description: This broom will always keep the floors nice and clean. No human required to operate. Happy Mogloween! Description: This broom will always keep the floors nice and clean. No human required to operate. Happy Mogloween 2013! This is a Mogloween 2013 Seasonal Rare! 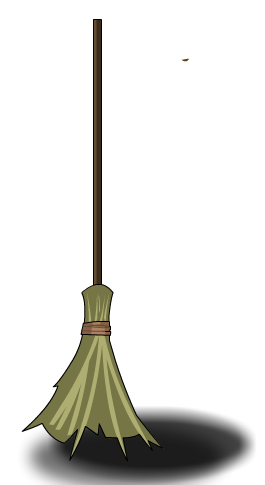 Description: This broom will always keep the floors nice and clean. No human required to operate. Happy Mogloween 2012! This is a Mogloween 2012 Seasonal Rare! Description: This broom will always keep the floors nice and clean. No human required to operate. Happy Mogloween 2011! This is a Mogloween 2011 Seasonal Rare! Description: This broom will always keep the floors nice and clean. No human required to operate. Happy Mogloween 2010! Description: This broom will always keep the floors nice and clean. No human required to operate. Happy Mogloween 2009! Location: Mogloween Legend - Mystcroft. Description: This broom will always keep the floors nice and clean. No human required to operate. This is the 1st Edition released during AQW's first Mogloween 2008! Thanks to cornfield10, Dasthur, L0re, Rattyman, Rj_nicx and Twilight Sky 023.